Branded Products - A Better Value! 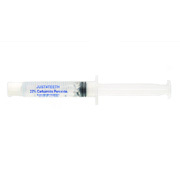 Just4teeth.com Whitening Gel in 16%, 22% and 35%Carbamide Peroxide whitening Gel made with US ingredents. We use the same ingredients that the big name brands but you can buy them at direct wholesale prices. If you are not happy with them simply let us know and we will refund your money--it that simple. Our Professional Carbamide Peroxide Whitening Gel is the strongest at-home whitening gel made and is the result of decades of research. This Highly Viscous (sticky) gel is one of the few gels that has been reviewed and released for sale by the FDA. Our formula contains no ingredients that have been found to be harmful or irritating (such as glycerin or TEA). We use the highest quality ingredients and manufacturing processes available. Carbamide Peroxide Carbamide Peroxide is the ingredient of choice for professional dental whitening. It is widely used by dentists and is manufactured in strengths ranging from 10% to 22%. The reason Carbamide Peroxide Gel is so widely used is that it maintains it's shelf-life for up to 3 years. Other peroxides, such as Hydrogen Peroxide, begin losing their efficacy immediately after manufacture and lose their potency after only a few months, rendering them completely ineffective. Oversized 5ml tubes Dental whitening gel is sold in three popular sizes. The vast majority of dental whitening gel is sold in syringes of 1.2ml or 3ml syringes. Our syringes are 5ml each. That's 4 times larger than the 1.2ml syringes and almost twice as large as the 3ml syringes. Our philosophy is to provide customers with plenty of gel. Because the price of each syringe and packaging is factored into the total cost of the gel, it is much more economical and cost-effective to use larger syringes. The reason every manufacturer does not use oversized syringes is that they want consumers to pay for bleaching gel as if it were liquid gold. They have their own interests in mind, not the interests of their customer. Demand that your gel is delivered in 5ml syringes, not 3ml or 1.2ml syringes. Highly Viscous (sticky) gel High Viscosity Gel is important because it allows the gel to stick to your teeth. This is essential to the whitening process. If a gel is not highly viscous, your whitening gel will leak out of the bottom of your bleaching tray. That slows the whitening process and creates unneeded sensitivities. As well, saliva can dilute a low-viscosity gel, rendering it non-effective. Our gel is a 22% High Viscosity Gel that is guaranteed to remain on your teeth throughout your bleaching sessions. FDA The FDA regulates dental bleaching systems as cosmetics instead of medical products and procedures. This means that manufacturers of dental whitening products are not required to get FDA approval on their products, however they can submit their products to the FDA for review if they wish. All of our products have been submitted to the FDA for review and have been released by the FDA for sale. Very few, if any other manufacturers of dental whitening gels and systems submit their products to the FDA for review and release. Since our products are reviewed by the FDA, you can be confident that the dental whitening products you are using have been properly formulated and labeled. Glycerin Glycerin is a highly allergenic base ingredient that is commonly found in whitening gel. It is not a great choice of base ingredient for consumers because it creates unnecessary irritation, has a terrible taste that lingers on in your mouth for hours and can cause extreme allergic reactions in many people. The reason it is commonly used in dental whitening formulas is because it is cheap for manufacturers to produce and it requires little quality control. Manufacturers using glycerin do not need to pay attention to the actual amount of peroxides included in their formulas because glycerin will mask any errors in the manufacturing process. Glycerin is great for manufacturers, but terrible for consumers. Custom Moldable Bleaching Trays are essential to the dental whitening process. Our ThermoForm Bleaching Trays are custom moldable in order to give your teeth the perfect fit. If you do not have custom moldable bleaching trays, your whitening efforts could lead to uneven whitening (zebra teeth), excessive sensitivities, and you may need up to four times as much whitening gel to get the job done. Our ThermoForm Bleaching Trays are so moldable and soft that many people think that they are as comfortable as expensive, lab-created bleaching trays. Our Thermoform Bleaching Trays are designed so that one size fits all. This amazing feature is accomplished by using a special blend of polymers that will shrink when placed in hot water. The trays are designed to be oversized to fit people with large mouths, but will easily shrink to fit people with the smallest of mouths. No other tray uses our special blend of shrinking polymers to accomplish this unique feature. Our Thermoform Bleaching Trays are molded by placing them in hot water. Our special blend of polymers has a very low molding temperature so there is no need to use extremely hot boiling water. This means that you do not need to place a very hot bleaching tray in your mouth and risk burning yourself during the tray formation process. Our ThermoForm Bleaching Trays provide more coverage area than any other bleaching tray. We did not skimp on material or design when creating the shape of our bleaching tray. You will get full coverage of all of your teeth, not just the front 6 teeth as in many other bleaching trays. In order to get the results that you are after, you may need to bleach the rear side of your teeth. Even though people do not typically look at the back side of your teeth, your teeth are translucent stains from the back side of your teeth teeth can radiate through your teeth so that they can bee seen from the front side of your teeth. Our bleaching trays are designed to provide effective coverage on both the front and back of your teeth. Most other trays on the market have been designed to provide no coverage on the back side of your teeth. Our ThermoForm Bleaching trays are made from a clear, see-through polymer. This is important because you want to see your teeth as you are placing your bleaching tray on your teeth. This is necessary so that you can assure that the gel is spreading throughout the tray and providing full coverage on all of your teeth. Many other trays are made from colored plastics or hazy plastics that are difficult to see through. Use of non-clear trays can lead to non-uniform whitening of your teeth. Our ThermoForm Bleaching Trays are remoldable. This is an excellent feature for new bleaching customers because they may need to make several attempts to make the mold correctly. If your first attempt is not exactly right, you can reheat the tray and try again. Most other trays are only good for one heating and cooling session.